Here’s Wolfie. He’s very old and he naps a lot. He was a rescue–they’re all rescues–but we’ve been together for thirteen years, so he’s fairly Zen now, except for the times he goes vamp face on me and I have to remind him who’s the Alpha around here. Not that there’s much doubt. I outweigh him by a hundred and fifty pounds. He looks very peaceful, doesn’t he? He should. He’s sleeping on my crochet with a heated mattress pad underneath and with his head on my pillow. It’s pretty much Dog Nirvana. Everybody else was mellow, too. My goal for this week: Get the thermal curtains up on the windows. It’s going to snow tomorrow (Wed) even though it was 67 today. Welcome to New Jersey. Dog zen – love it, thanks! Aww… he’s a happy guy. Your long-haired blondie made me remember an amusing video of a long-haired dachshund enjoying a shower in a sink. I’m amazed at all the colors that dachshunds actually have in their coats, since I grew up thinking the little brown wiener dogs were the only type. So sweet. I miss having a dog. Maybe next year. I’m not abig resolution person, but I promise you this – I will have a dog this time next year. Have two. They can keep each other company while you’re gone. Have two – that way one of them can pry open a door while the other one gets through to the trash. Have two – that way one of them can bark while the other naps so there is constant patrolling of the perimeter. If you get two, take the advice of someone who did it – don’t get two puppies on the same weekend. They’ll get along wonderfully but the only one who ends up exhausted is you. On the other hand, I’ve lost 15lbs and learned more about dog sports than I never knew existed. So it was worth it. I always say, “Have two,” because dogs are pack animals. Being left alone seriously freaks them out, and although they may adjust, they’re not happy about it. Since most people have to leave to go to work, you’re stressing your dog for at least eight hours a day. With two, they’ll still freak because you’re the alpha, but then they’ll curl up next to each other and deal. Thanks for the pictures. In MI, we’ve already had days where the high was 20F. I need to move. We had 60 degrees yesterday, 47 today, and 30’s incoming along with the snow. I’ve got half my plastic up and half not. One of my least favorite chores. This year I got heavier duty plastic which *might* resist the first time some cat sees a bug on the other side. Love me some doggy pictures! It’ll move over to Krissie’s blog on her site eventually. Thanks for sharing. So relaxing just looking at them. It’s all fine & good to say “stop & smell the roses” but someone should have added “stop and watch dogs/cats sleep”–there’s something very calming about seeing their little bodies so in the moment & sweet. Heated mattress pads are the best invention ever when it comes to winter. Right next to furnaces and fireplaces, of course. I miss the days when my two furbabies could make it up all the stairs into my bed to be canine heaters. After knee surgery last month I can’t even try to carry/help them up. *sigh* aging isn’t fun for woman nor beast, I’m afraid. What amazes me is that they prefer lying on cold tile to warm blankets or throws. I don’t get it. It’s the fur. They’re already warm. Milton likes to burrow under blankets (it’s a dachshund thing) but then he comes out panting because it’s too hot under there. Your dogs look so peaceful & at rest. My pup loves to lay in the sun too!! It must mean something. Good luck getting up those thermal curtains. Stay warm!!! Oh! Thanks! Wolfie’s smile made me so happy, and I love the sunny photo of the bed-dog-pile. Have a wonderful and cozy Thanksgiving. Love the dogs. I like having multiple dogs because it’s such fun watching their interactions. We have only two now, but we have had four before. Mona has the catbird seat…big pillow in the sun situated by the window. That way she can look out and check on the squirrels now and then. Dogs are a necessity of life for me. Think we should have a regular Dog-Tuesday with pics. They look so contented and well cared for – makes me happy to see ’em. (I have 2 ancient, much-loved rescues). The problem is, they’d be pretty much the same pictures. Everybody sleeps and I type. Sometimes I say, “Outside!” and Milton leaps to the floor and races for the dog door, Mona behind him yapping. Veronica looks at me like, “You must be joking,” and stays on the bed. Wolfe misses the whole thing because he’s asleep. 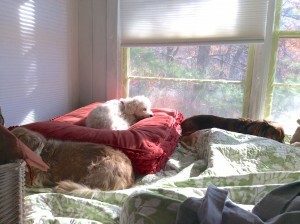 Ten minutes later, four dogs sleeping on the bed and me typing. Sounds so familiar. Mine have the same routine but they also have the daily noble-defence-of-the-house: mid-morning, the postman (the aggressor) pushes mail through the door flap and they leap from their baskets and race to the sound, snarling. If the smallest, fattest one is quick enough, he is able to wrest the mail from the postman’s nervous fingers as he pushes it through the flap. He then shakes the mail to kill it and stands over it, growling and snarling, tail quivering until he is sure it is dead – all of our utility bills have toothmarks on them. The other dog is older and creakier so she stands at the top of the stairs barking a warning. I hide behind the curtains so the postman doesn’t expect me (bad parent) to reign them in – they love it and it’s daily aerobic activity. It makes them happy. I vote for more pics of contented, sleeping dogs. 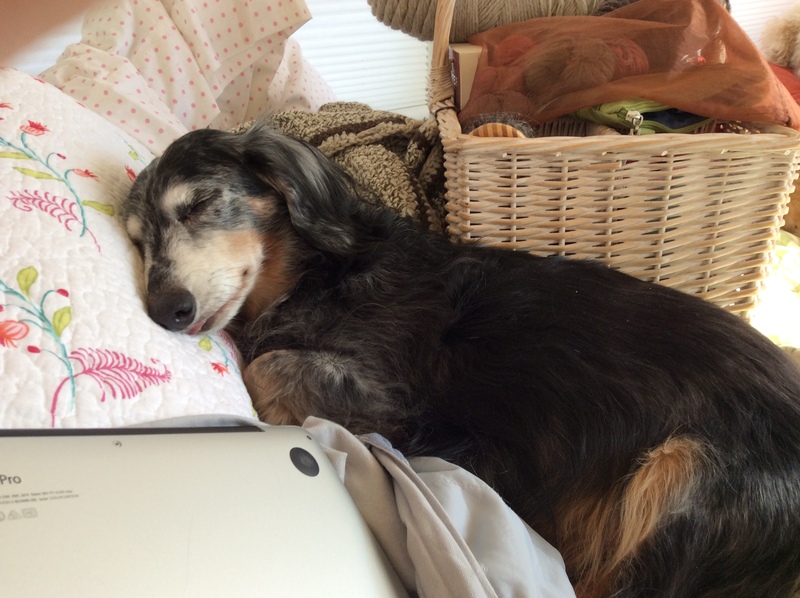 Thank you for the dachshund pictures-a lovely Thanksgiving present to Argh readers! I’d take regular weekly dachshund sleeping pictures quite happily. These are great. I could just feel the stress melting off my face and down my neck as I smiled. Wolfie is adorable. At our house, we’ve got kitties who have discovered the wonderfulness of Under the Blanket. Not sure why it took them so long to figure it out, but maybe it’s colder in the house this year. They are so friendly and cozy this month. They just adore their warm humans. My new hobby is fostering puppies (one at a time) for a service dog organization. The puppies have to spend 5-6 months of their training phase learning to live in a household and to go everywhere with a person, so they’ll be low-maintenance house-dogs and comfortable out in the world when they’re adult service dogs responsible for a disabled child. My first puppy (who’s now a seizure-alert dog for a little girl in Florida) HATED being alone in the house, but since he was supposed to accompany me almost everywhere, I only left him alone once or twice a month (if I went to the home of a friend with allergies or to an upscale restaurant, etc.). My current puppy can’t go as many places with me since she’s struggling with severe car sickness, so she stays home alone more often, for the time being. I now have three cats (and recently also fostered two kittens for the rescue group from whom I adopted my cats this year), so she’s not really alone–but the kittens, with whom she was great pals, were adopted 2 weeks ago, and my cats don’t like her, so I think it’s more lonesome for her now when I’m out of the house. And we’ve got to really tackle this car sickness thing in her final month or two with me. It’s still a huge problem, and she probably can’t go into service if she can’t get past it. Is that something she’ll grow out of? We sure hope so. Puppies -are- more prone to car sickness than adults (like children are, too), because the inner ear, center of balance, hasn’t fully developed yet. My parents raised show collies when I was growing up and spent many weekends on the show circuit (which meant lots of driving), and my mom reminded me last week that we had a number of collie puppies over the years who outgrew their car sickness when they were between 9 and 12 months. So I hope my current service foster will, too. I hope you know how awesome you are for sharing the greatness of rescue pups and providing such a great, loving home. Might be holiday emotions, but tearing up at how happy he looks, and at the stories of other commenters’ rescue pets. You know, they rescue me everyday. It’s a Mutual Rescue Society. And thank you for going out there on the front lines with the rescue people. It must be heartbreaking at times.